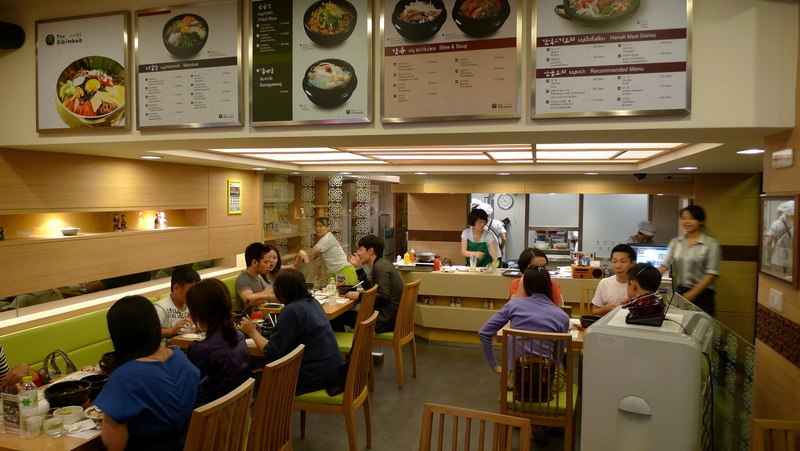 Recently a new Korean restaurant opened near the mouth of Sukhumvit Soi 24 immediately across from the Emporium. 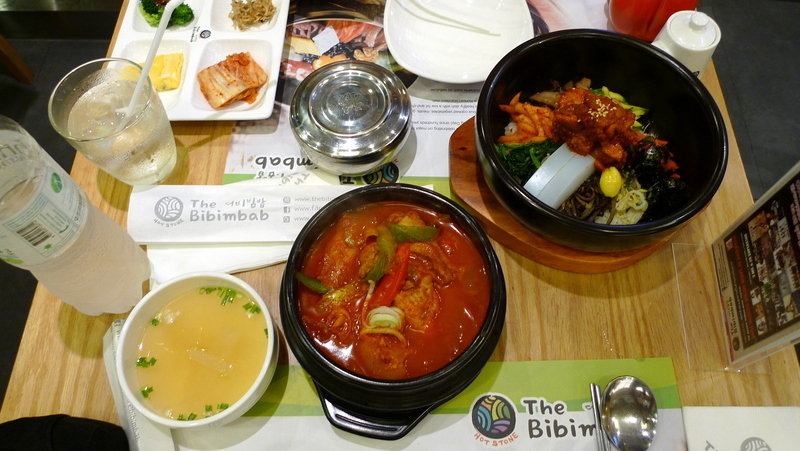 It is called The Bibimbab and its menu focuses on the classic Korean one-pot meal which features a ridiculously hot stone bowl filled with rice, vegetables, meat, and chili paste, which you then mix together before eating. Tawn and I visited for dinner two weeks ago. There are those cuisines with which I am extremely familiar and there are other cuisines about which I don’t know nearly as much as I’d like to. Korean is one of the latter. I always enjoy eating Korean food but I often feel a bit lost, uncertain of what I’m doing, how I should order, and whether the food I’m eating is very good or just passable by Korean standards. Bear that in mind as I talk about the restaurant, please. 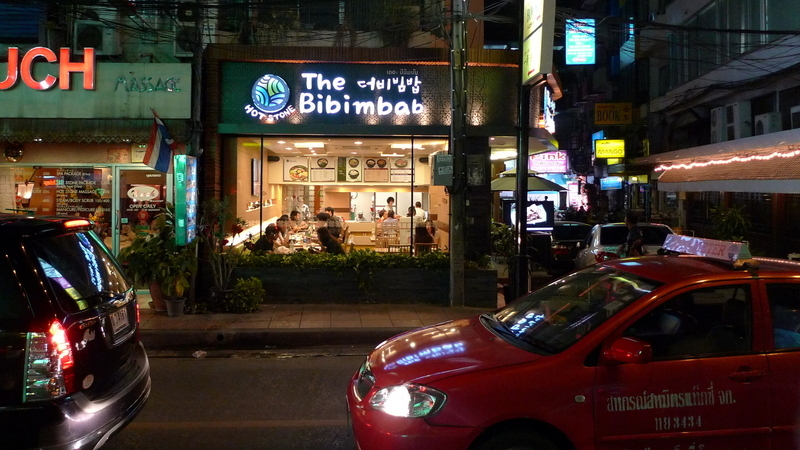 The Bibimbab is an attractive place to passers-by. The restaurant is airy and bright. The logo is colorful and modern. It is the type of place that is designed to appeal to people like me: those who like Korean food but don’t know much about it. That fact alone should probably make me nervous, right? We visited on a weeknight a few weeks after they opened. The tables were full and new customers were arriving and filling seats just as quickly as they were vacated. The interior looks a bit like a fast-food restaurant although it provides table service. 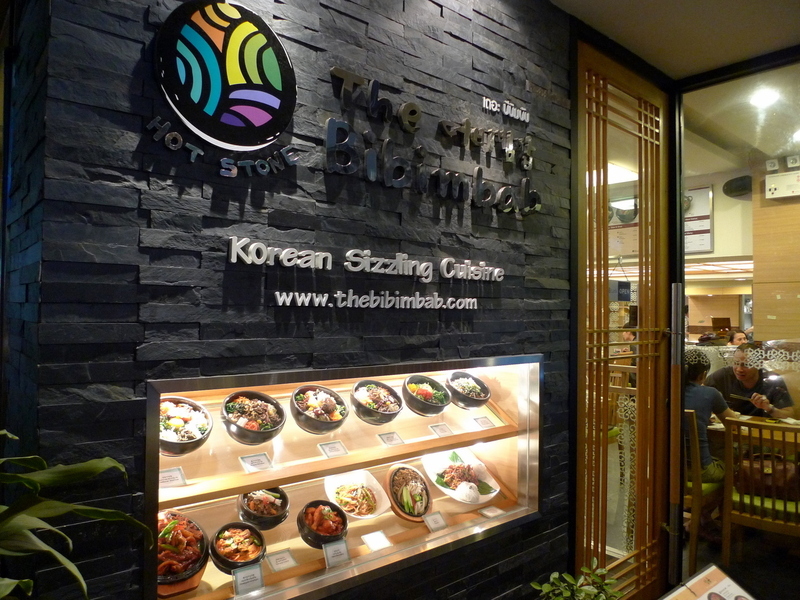 The menu focuses on bibimbab, fried rice, and soups. They do not offer any of the “grill it yourself” dishes that are popular at many Korean restaurants. The restaurant’s branding and social media marketing is very up-to-date. They clearly want you to connect with your favorite bibimbab restaurant via your smart phone, tablet, computer, etc. Their website actually offers useful information for the novice Korean food eater including helpful cartoons illustrating how to eat different dishes as well as general Korean food eating etiquette tips. Above is one an example of one of those helpful cartoons. 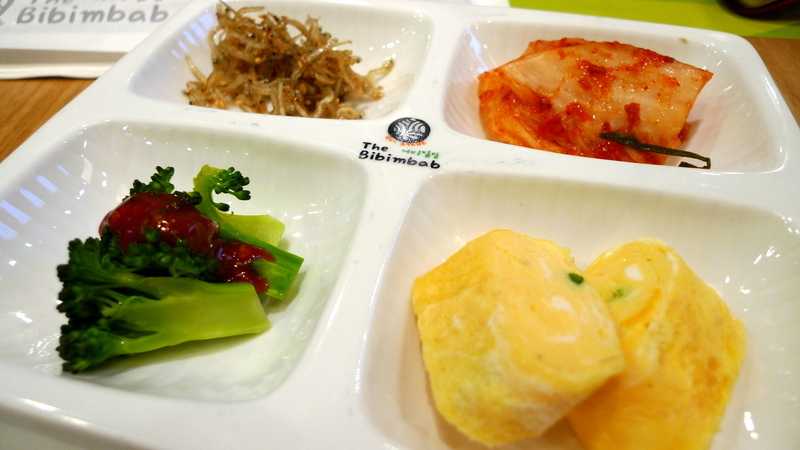 Your meal begins with complimentary banchan. These are the side dishes (often erroneously referred to as kimchi, I learned – which refers only to the fermented vegetables) that accompany rice in Korean meals. Just by writing this entry, my knowledge about Korean food has expanded! The restaurant refills these throughout your meal. While the staff was busy, they were helpful and friendly. An overview of our meal. We ordered two dishes and shared them. Along with the side of rice and broth that came with one dish, we had a very hearty meal for two people, coming in at about 500 baht or under US$17. 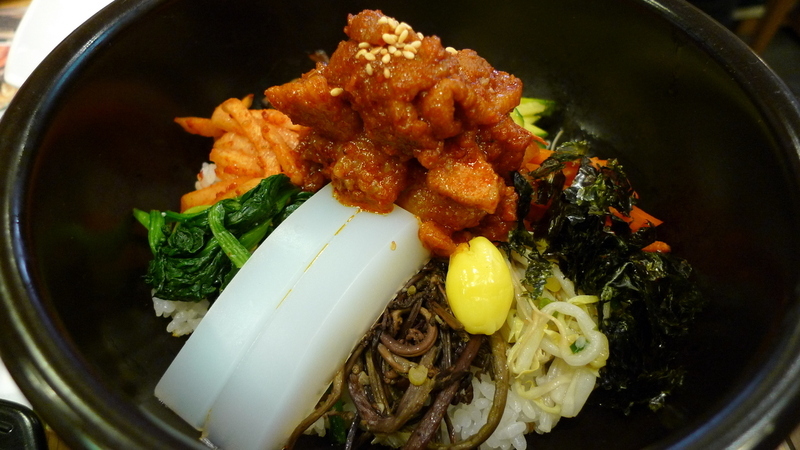 Our first dish was the jeyook bibimbab, rice and vegetables with spicy stir-fried pork. This was tasty. One of the nice things about bibimbab is the crispy crust of rice that forms at the bottom of the bowl. When it is time to eat it, there’s a nice crunchiness to it, a textural contrast to the rest of the dish. 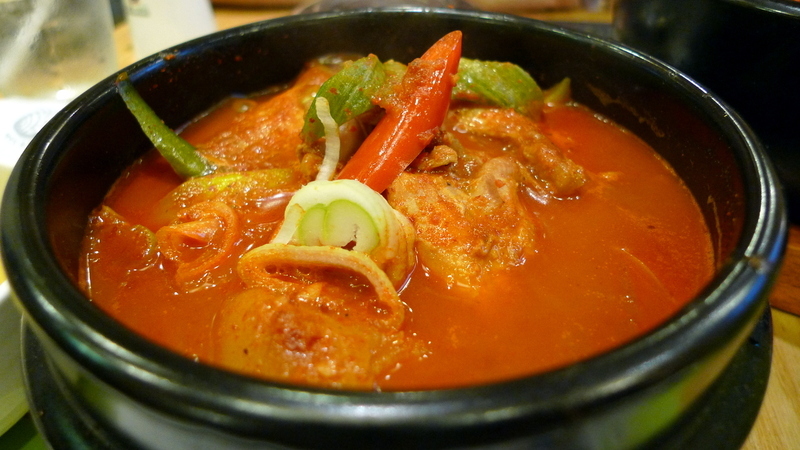 We also ordered dakbokkeumtang – spicy chicken stew with vegetables. While this wasn’t the spiciest Korean soup I’ve had – I remember a date years ago who took me to a Korean restaurant in Los Angeles, serving me a spicy tofu soup that nearly dissolved my tongue – it was spicy enough. Flavors were good and I couldn’t help but think that this would be perfect food for chilly weather… if only we had some chilly weather in Bangkok! 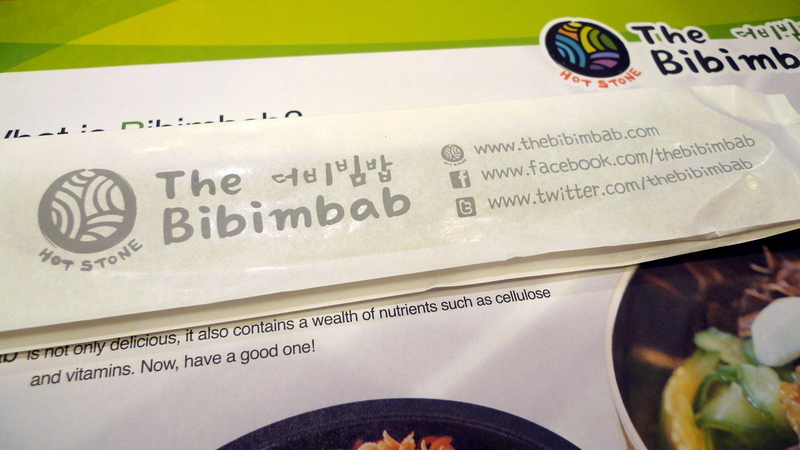 Overall, I was satisfied with The Bibimbab and imagine we’ll go back from time to time. The prices are reasonable for dinner, the portions generous, and the food is tasty. The question about authenticity is one I can’t answer, but at some level you have to ask whether authenticity is more important than simply enjoying the food. This entry was posted in Uncategorized and tagged Bangkok, Bibimbab, Bibimbap, Bibimbop, cuisine, Dining, food, Korean, Restaurant, Sukhumvit by christao408. Bookmark the permalink. Does look and sound like a successful place. Nice try for Korean cuisine in BKK! Next time you guys are in LA, we should visit K-town! I am unfamiliar with korean food but lately thanks to Joanne Choi’s blog that you’ve intoduced me to, I’ve been wanting to get to know more. This post is great. I learned more things now. yum, bibimbap is delicious! i’m not too familiar with all the ins and outs of korean cuisine, but i do enjoy it on occasion. That looks delicious! I can’t wait to expand my palet when I visit in the fall! Thanks for sharing. I love bibimbap and pretty much all the other korean food. I absolutely love Korean food. I love finding those small, hole-in-the-wall, family-owned restaurants. Looks tasty! What are the white gel strips in the bowl?? Good food and good company beats authenticity. Bibimbab is one of my favorite dishes! We have a place here that also focuses mostly on this type of dish, but their decor is a tad bit more odd (They’re called the “Owl of Minerva”. Strange name eh?). Nicely priced too! I wish we had a place like there here. The exterior looks pretty authentic, i.e., you find these kind of shops with the same exterior design aplenty in Seoul. The food looks good, too. I’ve never eaten that, I am curious! I know the Philippines love their fish sauce. I wonder if they gave you some because you are in Thailand?Good to see you got the small dried fish (I think that is locally made). However I think maybe the price of Bok Choy for Kim Chee is probably higher because it is a more northern growing plant. @murisopsis – That jellylike white stuff is pretty tasteless but is added for texture. You got me on the name of the stuff so I cheated and wikipedia name is Nokdumuk from mung bean starch. I could probably make a good meal out of the banchan. There’s a little hole-in-the-wall Korean place in my city; I used to eat there fairly often when I worked close to it. No idea about authenticity, either, but I liked the food enough that I’ve wished I knew what some of the side dish items were called so I could learn to make them or ask for them specifically. definitely looks very attractive from the outside. i often visit a korean restaurant here in jakarta, as there are many of them here and i do enjoy korean cuisine, though not to the extend of the spicy ones. Looks good.Interesting with the broccoli… Never came across that here.Too bad some bibbimbob I’ve had comes in a stainless steel bowl without the crunchy part… Fail!!! Many thanks to everyone for their comments. Sorry for taking a week to respond! @yang1815 – Seems to me that bibimbab served in anything other than a hot stone bowl is a pale imitation of the real thing… although to be fair, when it is served on an airplane they don’t use a hot stone bowl, either! @rudyhou – Interesting… I would have taken you for a spicy food eater, Rudy. @agmhkg – That’s interesting… I would guess that like a lot of cuisines, the restaurant versions tend to be more meat-centric than what you would find if you were just eating in a local’s home. @epiginoskete – That’s exactly the point I find myself in. “I like this… but I don’t know how to make sure I get the same thing if I go to another restaurant!”@Inciteful – Oh, sure you could… and at some restaurants it seems like you get a dozen or more of them! @vsan79 – Yeah, it is visually appealing, isn’t it? @fauquet – Hi Michael, I hadn’t made that observation so went back to look at the pictures. Yes, it was mostly a crowd of parents and their still-at-home children, although we saw a few multi-generational families come in while we were eating. @PPhilip – They didn’t bring the fish sauce and chilies over initially; Tawn requested them. @xOne_twentyX – Are there any Korean restaurants near you? You should try one out. @Devilzgaysianboi – Kimchi pancake sounds tasty! With or without maple syrup? @beowulf222 – I’m under the impression that it is related to some Korean chain… but maybe I’m wrong. @paperblanks – What an odd name…@Fatcat723 – That’s sure true! @jennfaceee – I especially like when one of those hole-in-the-wall places actually pans out and is decent! @JacquieCooks – @kunhuo42 – It is certainly a cuisine about which I’d like to know more. (Oh, and thanks Jacquie for the rec! )@diditdreaming – Glad you liked it. If you need any suggestions before your visit, please let me know. @awoolham – So glad you liked it. Yes, Joanne’s blog is a great source for recipe ideas, isn’t it? @CurryPuffy – I will take you up on that, Gary. No more of these fancy Japanese inspired restaurants, let’s dig into W’s culture a little! @nov_way – So far it is only a few months old; I’ll be curious to see how it does and whether they expand to other locations. I have a lot of fond memories of this dish. I remember as a kid it was a special treat to go to this Korean restaurant since Korean cuisine wasn’t as popular in Toronto as it is today and my dad ordered bibimbap. It’s just such a simple yet wonderfully delicious dish! @christao408 – me? spicy food eater? for a while, in earlier stage of life, i did consumed plenty of spicy food. nowadays, my palate begs for a more forgiving flavor profile. i do think spiciness in food brings out the full flavor of the dish, and as the flavor dances around in one’s mouth, one can’t help but to beg for more. unfortunately, such flavor profile what makes me seem like taking a shower in public. rain of sweats easily pour out from the pores of my skull and they drip endlessly. i prefer to look that way in the privacy of my own home. @rudyhou – So you don’t like to “glow” in public, eh? 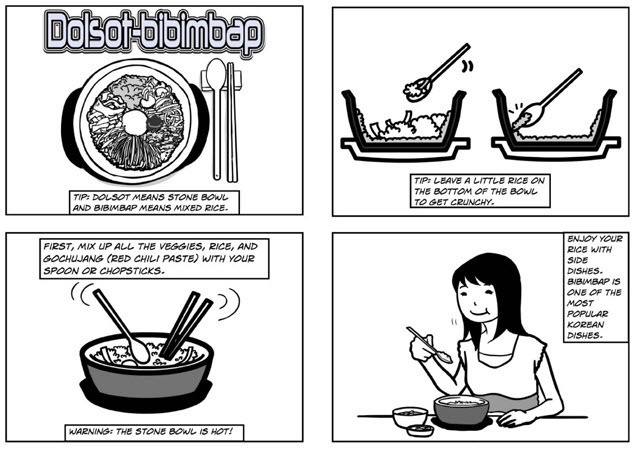 @brooklyn2028 – Great that you have so many childhood memories about bibimbab, Sheldon. @christao408 – gosh, NO. but i have been know to ‘glow’ from time to time. guess it’s tough to keep yourself dry at all times in public when you never know how the food in restaurants gonna affect your sweat glands. mmmmmmmlooks really good ! especially the spicy pork dish . thanks for the info from a novice’s point of view! you’ve made it all sound very inviting ! @vinimanilli – Glad you enjoyed it. Thanks for your comment. @earthitinerant@twitter – Thanks for stopping by and adding your comment.